The use of a 4:1 Ruthroff balun at the base of a ground mounted un-tuned multi-band vertical is very popular, perhaps because several manufacturers recommend such a configuration, famously on the 43′ vertical, or perhaps infamously… read on. Let us consider a ground mounted vertical, with a field of shallow buried radial wires, and a coax feedline that is buried. In that case, the potential V/2 at the shield terminal of the balun will cause a (common mode) current to flow on the outside of the shield, see Fig 1. Since the cable is buried, the current will be rapidly attenuated by loss of the soil as a dielectric, so that very little common mode current will enter the shack, but RF power has been wasted in heating the soil. Realise that V/2 can be very high, potentially thousands of volts at modest power on the lower bands, and the power lost in heating the soil can be substantial. The situation is not good, but if you view the world through a VSWR meter, you could be fooled. The ground loss tends to improve the VSWR, which just demonstrates that VSWR is not a good single metric for system performance. In the case of a feed line that is well above the ground, exciting the shield of the feed line by raising it to V/2 cannot be a good idea, it distorts the antenna pattern, and assists a common mode feedline current at the shack end of the feed line. If the feedline is somewhere between fully buried, and well clear of the ground, the situation is somewhere between the two limits described above… and still not good! There is no rational explanation for the ‘design’, and after recent public discussion of the nonsense of the design, at least one manufacturer has changed his recommendation to a 4:1 voltage unun where the coax shield is at the same potential as the ground system. 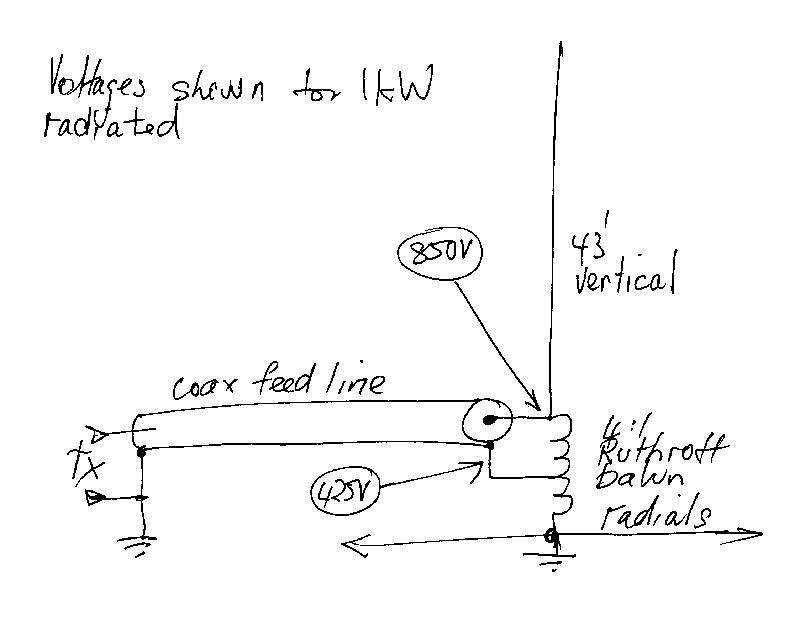 I raised the design issue some years ago in An unloaded vertical as a multi-band HF antenna. There is no doubt that a 4:1 Ruthroff balun is not suited to the job, but that doesn’t suggest that a balun is inappropriate. In ground mounted and elevated vertical antennas where the feed line is not buried, there is a prospect of common mode feedline current, and one or more common mode chokes (current baluns) may be part of an effective mitigation strategy. The remaining question is whether the 4:1 impedance transformation is better than none. That depends on the coax length, loss characteristics, ground system resistance, and frequency. It is not universally better, not universally poorer. The loss in the now recommended 4:1 unun can be quite substantial at low frequencies where the feed point impedance is extreme (R may be low, but X is extremely high), voltage is extreme, and the core flux level is extreme… and the problem is worse if the ground system is very good. In the example above, a practical unun might well have an parallel equivalent loss resistance of around 3kΩ, which at 850V would dissipate 850^2/3000=240W. No practical unun sold for ham purposes can dissipate this level of power, and it is quite likely to saturate the magnetic core. Note that the unun losses will make it easier to match up using an ATU, but at the expense of system efficiency. This effect could be mistaken as demonstrating that the unun is 'working', whereas a resistor would 'work'. The recommendation to use a Ruthroff 4:1 Unun in this type of antenna system is nearly as irrational as that to use a Ruthroff 4:1 Balun. The article An unloaded vertical as a multi-band HF antenna gives a more extensive treatment of the ground mounted antenna, and An unloaded elevated vertical as a multi-band HF antenna looks at issues with an elevated feed.